The first workshop, held in July at the Spencertown home of artist Linda Horn, a practitioner of landscape restoration and creator of healthy and beautiful native ecosystems, was SOLD OUT. If you missed it, or would like to attend a second session, we are offering Part II. 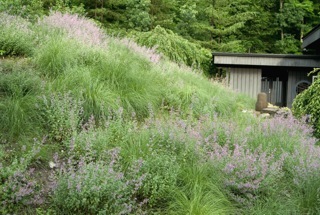 In 2005 Linda decided to create a one-acre Eastern meadow based on her past experience of installing a 5-acre tall grass prairie in Michigan. The plant selections were very similar. It has developed into a fully established, sustainable ecosystem and a haven for beneficial insects, birds and wildlife. The meadow will be in its full glory in early September and it is a prime opportunity to view this dynamic landscape. In addition to learning from Linda’s vast experience in creating a natural, low maintenance landscape, Part II will feature special guest Barbara Hughey, a professional land steward consultant. Barbara will share fascinating information about medicinal plants and fungi that are utilized not only by us, but also by all forms of wildlife. In her work in landscaping she has often observed wildlife making use of the medicinal plants. Now, due to over harvesting, agricultural practices and other kinds of development, these important plants are often missing or sparse, and their loss is a critical missing link in our environment’s health. The morning will start with a short talk by Barbara and then a tour and explanation of the work undertaken in the meadow, woodland, wetland and domestic areas (including driveway and home). Linda will tackle your specific issues and share techniques and sources. If you have problems to conquer in this area, please bring questions and photos (on your iPhone or tablet). Click HERE to make a reservation. Click HERE for more information about Linda’s property and click on the Terra Constructa link.